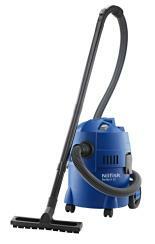 The Nilfisk Buddy II 12 is a small, lightweight, yet powerful helper for picking up Wet & Dry debris... for your home, car, workshop, hobbies and even for outside cleaning. The Blow function provides you with another option for cleaning. The standard wet filter protects the turbine and ensures a long lifetime. The built-in accessory holder provides storage for your accessories so that they are always at hand. Ergonomic grip ensures that the machines is in balance when you carry it around. The grip is shaped so that you can place the tube on top when having a break.